After dinner-time Mullyan came back. When he reached the entrance to his house he put down his big spear outside. Then he went in and threw himself down to rest, for long had he walked and little had he gained. In a few minutes he heard his big spear fall down. He jumped up and stuck it in its place again. He had no sooner thrown himself down, than again he heard it fall. Once more he rose and replaced it. As he reached his resting-place again, out burst a flame of fire from the end of his humpy. He called out to the three women, who were cooking, and they rushed to help him extinguish the flames. But in spite of their efforts the fire only blazed the brighter. Mullyan’s arm was burnt off. The Moodai had their feet burnt, and Buttergah was badly burnt too. Seeing they were helpless against the fire, they turned to leave the humpy to its fate, and make good their own escape. But they had left it too late. As they turned to descend the tree, the roof of the humpy fell on them. And all that remained when the fire ceased, were the charred bones of the dwellers in the yaraan tree. 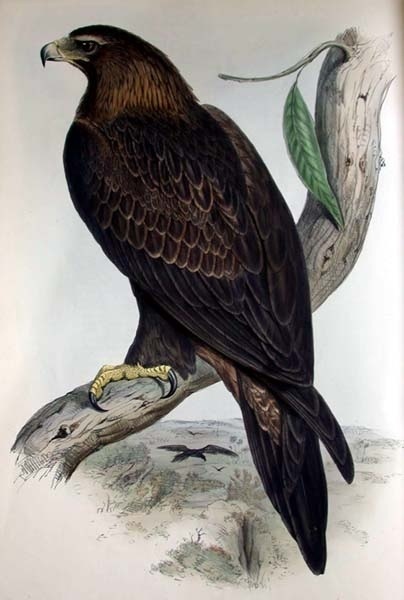 That was all that the blacks found of their enemies; but their legend says that Mullyan the eagle hawk lives in the sky as Mullyangah the morning star, on one side of which is a little star, which is his one arm; on the other a larger star, which is Moodai the opossum, his wife.